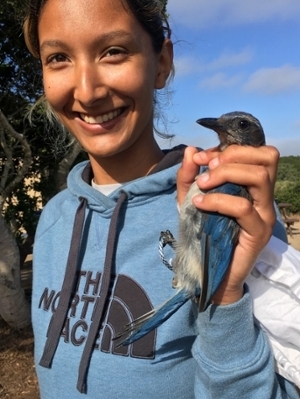 As an undergraduate in Environmental Studies, Rachel Perpignani put her years of Ornithology experience to work in an internship that brought local school kids to UCSC Fort Ord Natural Reserve. Now that she has graduated, Rachel supervises the reserve bird banding station. She is also an Aviculturist at Monterey Bay Aquarium. This piece describes our program and highlights her experience. 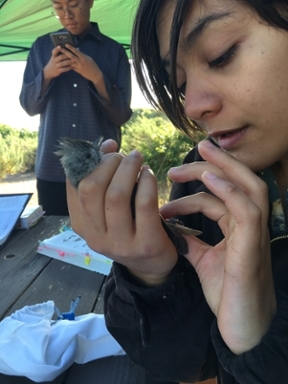 CSUMB biology student Sarah Morgan learns how to handle a California scrub jay. Undergraduates at UCSC Fort Ord Natural Reserve gain field experience that is often difficult to find in a university setting. In the spring of 2017, I was a CSUMB senior and bona fide bird nerd, searching (rather aimlessly) for a capstone project that both pertained to my passion for wildlife biology and offered opportunities to share my love of nature with local youth. After briefly considering otter and endangered blackbird projects, networking and serendipity brought me to a meeting with fellow bird enthusiast and Field Manager of UCSC Fort Ord Natural Reserve (FONR) Joe Miller. With 600 acres of protected maritime chaparral, oak woodland and coastal scrub, FONR was an ideal locale to conduct a bird-related research project. I couldn’t have imagined that 2 years later, the station that I envisioned only in the context of my own student project would have served hundreds of students from kindergarten to college seniors, supported a robust internship program of UCSC and CSUMB undergraduates, and gathered a formidable data set of almost 700 birds captured from over 40 species. “How do you catch them,” I’m often asked by curious grade schoolers and community members. At FONR we use mist nets and baited traps to target passerines, an avian group commonly known as songbirds. Made of very fine nylon strands, the gossamer quality of a mist net renders it invisible to birds. Traps, by comparison, lure in hungry granivores with seeds like sunflower and millet. Although we’ve been surprised by the occasional raptor, including Cooper’s and sharp-shinned hawks, this equipment reliably captures smaller birds like the Wrentit, a range-restricted species likely dependent on the coastal scrub, chaparral and oak woodland habitats that dominate UCSC FONR. The Bird Banding Laboratory, the agency that receives and manages all bird banding in North America, notes that “because birds are good indicators of the health of the environment, the status and trends of bird populations are criticalfor identifying and understanding many ecological issues and for developing effective science, management and conservation practices.” In June, a grasshopper sparrow, a California Species of Special Concern, was captured and banded at FONR, reinforcing the importance of gathering data on bird populations in habitats critical for both migratory and resident species. Over 200 local students and community members have visited the FONR banding station since we opened our first nets in March 2017. These include young naturalists from The Bird School Project, Los Arboles Middle School, Ventana Wildlife Society, El Sausal Middle School, Return of the Natives and others. 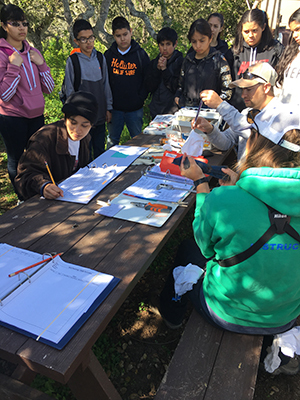 Community members participating in the annual UCSC Bioblitz now pass through our station during its operation, adding value and close bird encounters to the time they volunteer cataloguing species abundance and diversity at FONR. In the future, Field Manager Joe Miller plans to implement avian point count surveys to supplement banding records with observational data and train students in another important technique widely used by professional field biologists. Today, thanks to an exceptionally rainy winter, the reserve is shockingly green and our staff and banding interns are eagerly anticipating a busy spring migration. 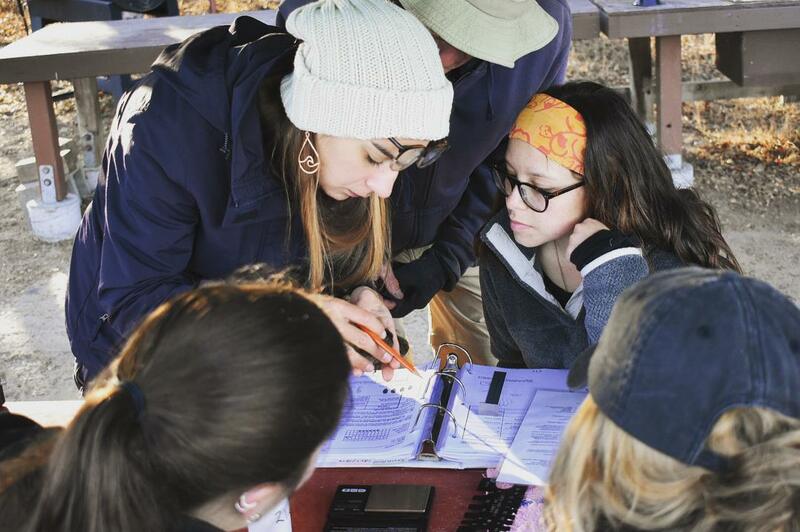 We’re proud to support the curiosity and knowledge of tomorrow’s biologists and look forward to continuing to serve our community by sharing the unique practice of bird banding. Contact Field Manager Joe Miller at joemiller@ucsc.edu for more information about how you can get involved as a student, plan a field trip to the reserve, or give to the UC Santa Cruz Fort Ord Natural Reserve education programs.